Spot the wacky "watermelon" speakers! Backgrounder: The house is open plan with large stone fireplaces in the sunken Lounge, Dining Room and Master Bedroom. There are electric curtains along the entire length of the house downstairs and a combination of electric blinds and curtains upstairs. Working closely with the Interior Designer, the goal was elegance and discreteness. The Client's primary goal was easy of use, combined with the ability to control all lighting (including outdoors), the THREE huge stone fireplaces, curtains, blinds, the stunning outdoor waterfall, garden lighting and the multi-room AV system - ALL with a single remote - no mean feat! 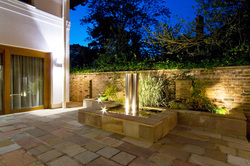 Design Brief: ﻿High quality, audio was required throughout the house and garden. Access to a sixteen camera, night vision surveillance system, both from the TVs around the house and also remotely by mobile phone was a pre-requisite. Finally the system platform was to be based around a Media Center with the ability to access the Internet and e-mails and also to continue watching SkyHD or a DVD anywhere in the house from the point that it had been paused. 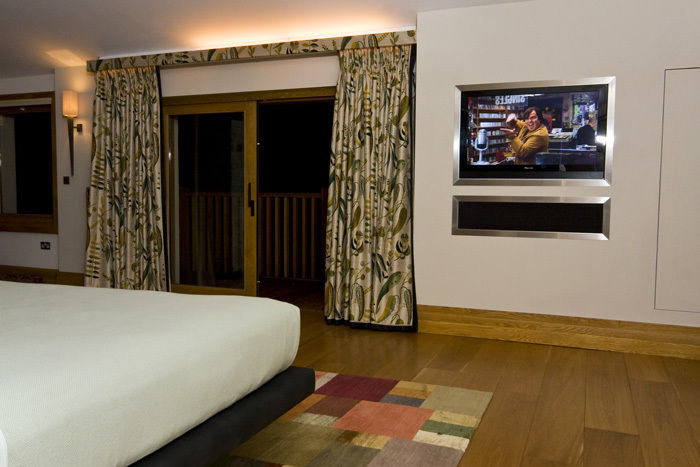 Technical Finesse: As the TV in the Master Bedroom was located in the corner of the room, in order to provide surround sound in the bedroom, a Yamaha digital surround speaker was located under the TV, negating the need for multiple unsightly speakers. The Kitchen TV was mounted on a custom aluminium pole which when swivelled was completely hidden from view behind the stone wall in the annexe. 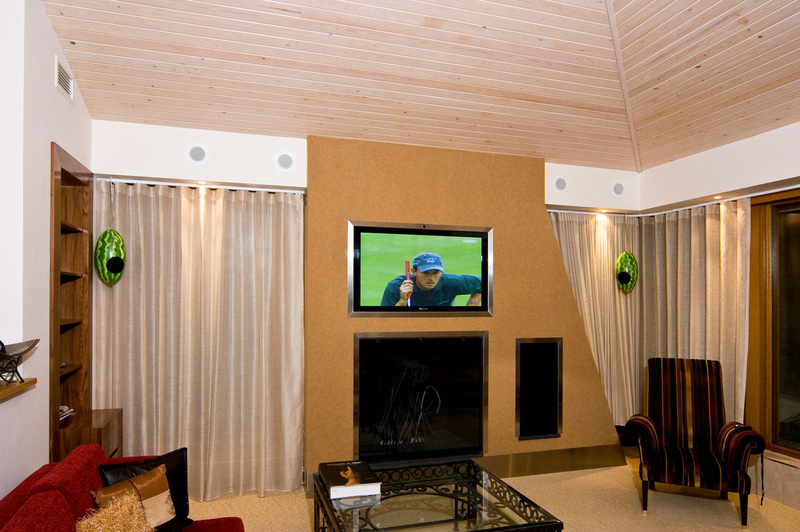 The lighting system was configured to work from the latest wireless remotes, allowing the client to select lighting moods in any room or across the entire house in one button press.